The final track component was installed at Merchant Park on Wednesday 25 March, connecting the factory with the rail network for the first time. Network Rail, Hitachi Rail Europe and Story Contracting fixed the last Pandrol Clip at the £82 million Newton Aycliffe site which will deliver the next generation of high speed rail carriages to the UK and Europe. 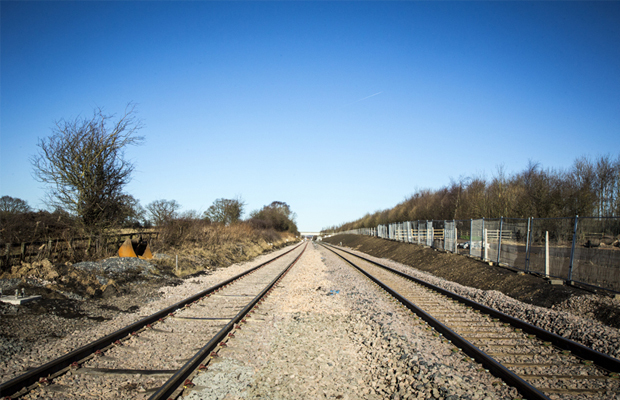 The final Pandrol Clip, a rail fastening, which is used to fasten rails to railway sleepers, is the final installation of 35,000 fixings that Story Contracting have installed on behalf of Network Rail and symbolises the completion of track works and the connection of new track to Hitachi’s Rail Europe’s Facility. The project has also seen the installation of 7,000 metres of sidings and a new 1km long overhead electrified test track, along with the reconfiguration of the existing branch line and its connection to the site. Expected to be completed by mid-2015, work will now concentrate on the interior fit-out of the facility, which has already started. Phil Verster, Route Managing Director, Network Rail said: “Today’s final fixing signals an important milestone in this exciting project. The Intercity Express Train will bring a step-change for passengers, enabling more and faster journeys. This facility is an achievement in itself and will continue to bring economic benefits to the north east as well as maintaining the region’s proud rail heritage. Once completed, the facility will serve as a Hitachi Rail Europe facility for train manufacturing and assembly. It will be the base for the construction of the new Great Western Main Line and East Coast Main Line trains the company is building for the Government’s Intercity Express Programme (IEP), as well as the new AT200 trains for Abellio’s ScotRail franchise. “We are investing record amounts in our railways as part of our long-term economic plan. Connecting the Hitachi train facility at Newton Aycliffe to the track is a key step in roll out of the InterCity Express programme, which will create hundreds of jobs locally and thousands more across the UK supply chain. “Today’s final fixing signals an important milestone in this exciting project. The Intercity Express Train will bring a step-change for passengers, enabling more and faster journeys. This facility is an achievement in itself and will continue to bring economic benefits to the north east as well as maintaining the region’s proud rail heritage.